TAO GROUP BLOG TAO NIGHTCLUB LAVO NIGHTCLUB TAO BEACH LAS VEGAS: TAO AND CINEVEGAS PRESENT: THE LAS VEGAS PREMIERE PARTY FOR THE INTERNATIONALLY ACCLAIMED DOCUMENTARY "THE SEPTEMBER ISSUE"
TAO AND CINEVEGAS PRESENT: THE LAS VEGAS PREMIERE PARTY FOR THE INTERNATIONALLY ACCLAIMED DOCUMENTARY "THE SEPTEMBER ISSUE"
TAO & CINEVEGAS are pleased to announce the Las Vegas Premiere Party for the internationally acclaimed documentary "The September Issue". Thursday September 24th at TAO Nightclub, doors open at 10pm. 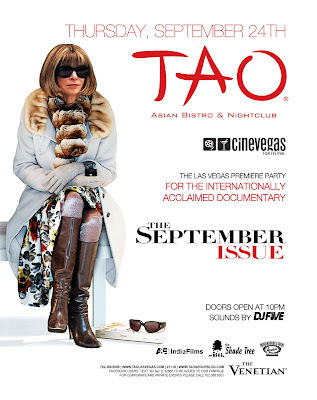 For guestlist and VIP table inquiries (702) 388-8588 or email: info@taogroup.com.